ANTISKID&STABLE TRIPOD : It is made from anodized aluminum rod and antiskid rubber handle of anti-rust, which is rugged and comfortable to use. 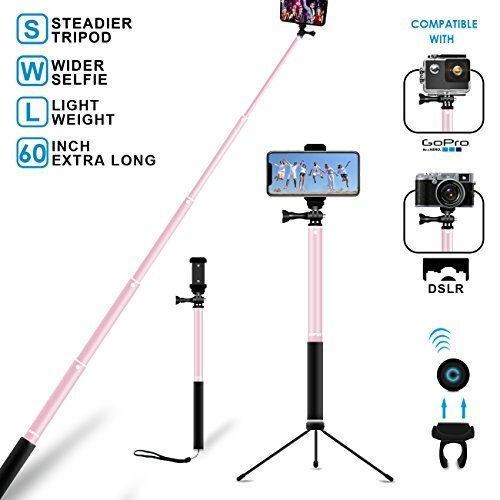 And you can easily switch the selfie stick to a tripod and stable shooting.Perfect for any desk or tabletop, uneven surfaces, or wrapped around the back of a chair, railing, branch, or pole! LIGHT AND COMPACT: The selfie stick will easily fit in your handbag, making it ideal for a spontaneous selfie - at only 11.4" long when retracted, this stick can conveniently fit into small bag. DURABLE AWESOME GIFT FOR THE HOLIDAYS: What a great surprise to get a High Quality Professional Selfie Stick. Everyone can use it and will love it. You need a quality Selfie Stick for gifts. The MFW is all quality! Get it today! If you have any questions about this product by MFW, contact us by completing and submitting the form below. If you are looking for a specif part number, please include it with your message.